Forest Fairy Girl - Light wood Cane. 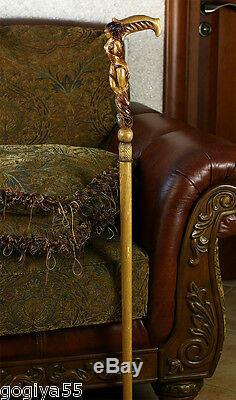 Unique designer art Fantasy Magic Wood Carved Hand Crafted Walking Stick cane. New fully functionally men's Wooden Cane. This walking cane has been created. By our family Workshop "GC-Artis", Ukraine (Eastern Europe). 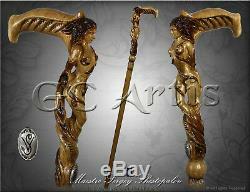 ORIGINAL CANE has the metal Medallion with the. 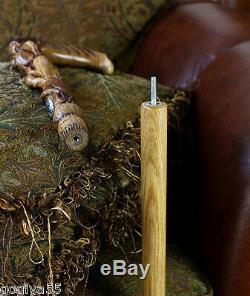 Art in Function: Fully functional handmade cane directly from the Artist woodcarver. Class craftsmanship with detaled fine carving. Made by hand is really impressive. Handle and shaft are connected by reliable screw. This is done from a natural wood and carries a strong energy to its owner. Which is deeply meaningful in mythology - slow growth, very strong and impressive. You will love a natural and pleasent to touch material. We are not resellers but small series cane makers since 2004. Unisex, well for RIGHT-handers & LEFT-handers. 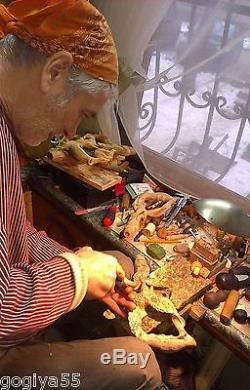 Sergiy is one of the best woodcarvers of Ukraine who makes amazing cabinet and yacht interiors. Wine racks and watch from a single tree trunk. He works hard with two. Journeymans to make some pieces of each cane design per/month. So I have very limited editional for sale SEMANTIC OF COMPOSITION. This cane points to the potential of harnessing oneself into the energy of the Nymph/Fairy of the woods - the Green women archetype. The forest represents the boundary of civilization - a wild place, where many find refuge - including shamans, holy men and women, poets, freethinkers and of course trolls, elves and fairies. Using this cane connects to the deep rooted creative and free female principle of growth, being grounded into respect of life within lush vegetation and life AS growth - full acceptance of femininity in full force. The DNA spiral flow upwards of plant essence through and over the body of this Wood Fairy represents a connection to the life force of regeneration through wood energy - literally. 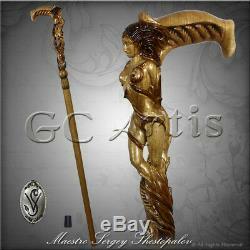 Tap into this cane as a regenerative force - hold and embed the fairy energy! This walking cane fitting as an additional fashion accessory, underlying individual style for men & women, ladies & gentlemen over city avenues and suburb/village anes, or walking in the wild as additional Protection against wild animals as well as a pleasant walking instrument for old elderly people. This walking stick an excellent addition for any art collection, an original gift idea for Birthday, Mother's / Father's / Veteran's day or an unusual prop for an costume party, original photo set, theater or movie staging. This walking cane is a fully functional & probably it more convenient than a most of usual canes from a medical store but it is not certified as a medical product. So if you have serious musculoskeletal disease or are prone to fall or have suffered surgery after a fracture / insertion of an artificial limb or artificial bone / joint, then we do not recommend to use this cane before consultation and approval by your doctor and replace the standard rubber tip to a medical one. 7-14 days to most European Countries. 12-16 days to USA, Canada, Israel. 18-28 days to Australia, New Zealand, South America. Please take care of cane from falling onto a hard surface such as concrete or asphalt, or ceramic tile. It tends to fall if you left a cane to lean on the wall and can get a crack or delicate details or fracture. So we recommend to use a hand strap. Before use, make sure the screw connection is tightly screwed. Otherwise, you may get unstable support or damage the cane. 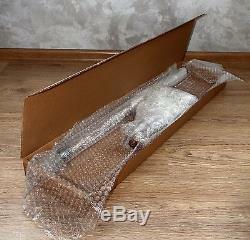 But this is not intended for every day assembly / disassembly. The meteoric thread can become weak after a frequent cycle of twisting and untwisting. Please check that you are leaning on the cane correctly. The main force should be directed as close as possible to the shaft but not the rear end of the handle. Incorrectly positioning can cause shaft bend and discomfort and even breakage of the shaft. Each GC-Artis cane has a standard, NOT medical, summer rubber tip in a set. Also use soap or candle wax to put a rubber tip on easily. The optimal length of the cane is a very individual parameter. It depends not only on your height but also on the length of your arms, the posture, the manner of walking and the thickness of the soles of the shoes you wear. Usually we propose to send the standard 36 inches length walking stick cane. If necessary, you can shorten a wooden shaft on a place easily using any saw. You'll receive the rubber tip in the set which hidde any traces of cutting. It is a good idea to use a paint tape to protect the wood from splitting while cutting off the shaft (wind the shaft above the cut-off point). But If you want me to cut your cane before sending, please try to determine the optimal length very accurately using standard method you will find in Google, but do not remind to consider thickness of your shoes sole! It is easy to make it short but very hard to make longer again. We do not recommend to storing the cane near a heating appliances and in the hot sun. The wooden parts can become more brittle with excessive drying, and this can lead to a crack at high load. Each walking cane made by GC-Artis has a professional varnish coating which protects against common atmospheric phenomena like light rain or any short-term wetting with non-aggressive liquids. But increased moisture for a long time or immersion in water can lead to deformation of the wooden parts. Contact with aggressive chemical liquids and solutions can destroy the varnish coating. We recommend to use warm water with a soap solution or any certified cleaning agent for wooden goods and furniture to clean your cane. After cleaning, wipe with a dry cloth. Also we recommended once a year to polish the surface of the cane in order to restore the gloss of lacquer coating and to remove plaque oxidation from metal parts and minor scratches. Use professional products for polish. We are not a resellers but the makers, so you will get better service and first prices! The item "Wooden Hand Carved ane Walking Stick Crafted Forest Fairy Girl Fantasy Magic" is in sale since Wednesday, April 11, 2018. This item is in the category "Clothing, Shoes & Accessories\Unisex Clothing, Shoes & Accs\Unisex Accessories\Canes & Walking Sticks".